Prayuth’s government is failing to reverse the country’s economic decline. Thailand’s ruling military junta is proving to be as clueless about economic policy as it is disdainful for the rights of civil society. In May 2014, General Prayut Chan-o-cha seized power from the democratically elected government of Yingluck Shinawatra, promising to bring Thailand back to prosperity. Yet he and the ruling junta have shown themselves to be completely outmatched by the challenge to reverse Thailand’s economic decline. Instead, Thailand’s economic situation has suffered further declines, a nosedive similar to the battering administered to civil liberties at the hands of the military government. Since taking power in May 2014, both rural incomes and exports have fallen sharply, and Prayut’s junta has consistently delayed a necessary devaluation of the Thai baht in order to counterbalance the yuan’s slide. The country lost in 2014 between US$8.5 billion and $12.8 billion in missed GDP growth, FDI flows tumbled by 38.7% in the first 6 months of 2015, exports contracted by almost 5% while household debt reached a ten-year high. And since the politics of fear are timeless, Prayut has been looking for scapegoats to distract Thais from the worsening reality of their daily lives. In early September, overthrown Prime Minister Yingluck Shinawatra was hauled in front of the country’s Supreme Court to answer for the alleged corruption surrounding her rice-buying scheme. The controversial program paid rural Thai farmers above-market rates for their rice and left the government burdened with millions of tons of unsellable produce. Essentially a way to curry favor and empower Thailand’s rural masses, the program was beset with allegations of corruption, fraud and embezzlement. Now Yingluck is being called to pay tens of billions of baht out of pocket to cover the supposed losses from the program. While the junta might try to portray the trial as part of a concentrated effort to purge corruption and government excess, the campaign against Shinawatra’s economic programs (which, from the perspective of Thai farmers, were largely successful) is more a matter of drawing attention away from the failures of Prayut’s regime by rehashing the allegations of corruption and misappropriation of funds levied against the deposed government. While the “make them pay” narrative might play well for a while, in the long run it cannot succeed in distracting ordinary Thais from the fact that things are getting worse, not better, under Prayut’s military government. Prayut’s solution to the economic malaise allegedly caused by Yingluck appears to be a mere carbon-copy of the former government’s own polices, with a healthy dose of while elephant infrastructure projects and stimulus packages added into the mix. The charade of change is underlined by Prayut’s decision to appoint Somkid Jatusripitak, former deputy prime minister and commerce minister under the deposed government of Thaksin Shinawatra, to take charge of the government’s economic policies. Somkid is already reverting to what he knows best: so-called “Thaksinomics,” an economic program named after former Prime Minister Thaksin Shinawatra and condemned by Prayut and other members of the junta. In essence, Thaksinomics is a progressive policy used to win over the rural population of Thailand by pumping money into rural development and giving handouts. But by all accounts, Thailand’s economy growth is a function of a weak baht to power exports and the disposable income of the rural population to drive consumption up – a fact well understood by Thaksin. Prayut, on the other hand, in a bid to weaken the traditional power base of the Shinawatras has left the farmers living in the country’s south out to dry. Borrowing a page from Beijing, the junta launched upon ‘taking’ office in 2014 a $75 billion program of building road and railway projects. Despite looking impressive on paper, does not address the key problems of the Thai economy. Somkid immediately reversed course and launched two stimulus programs, one providing low interest financing to SMEs (worth some $5.8 billion), on top of a $4 billion one targeting low income individuals by offering interest-free loans, investing in public facilities and subsidizing rural projects. Despite the junta’s widespread demonization of the Shinawatras, Thailand’s economic realities and Prayut’s lack of fresh ideas – other than excoriating his predecessors – have sent the country’s GDP tumbling down. It is laughable that the same individuals he discredited are now put in charge of reversing the economic uncertainties caused, in good part, by the coup. However, there is a method to Prayut’s apparent madness. Appointing Somkid as head of economic policy makes a “retrograde maneuver” (to use an old euphemism for retreat) much easier: if Somkid’s policies fail, Prayut can turn around and haul him before the courts (military or otherwise) and hang the blame for economic distress on an erstwhile Shinawatra loyalist. There are precedents for this kind of political retribution. Recalcitrant MPs critical of the blundering junta are being hauled to remote military bases for “attitude adjustment” sessions, while “civil society” as it is conventionally understood has all but ceased to function. Laws against defamation, public assembly, indeed, criticizing the government in any way, have proliferated under the military government. 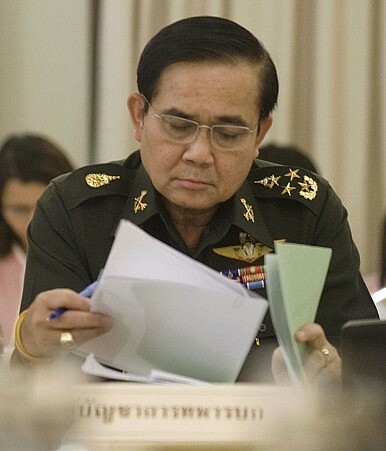 Meanwhile, in mid-September 2015, Prayut pushed back the date of the much-promised democratic elections for the fourth time, after a draft constitution was rejected by the military council. The junta outlined a 6-4-6-4 tennis-like roadmap to democracy, under which it extends its rule to at least 2017. The postponement signals that Prayut is not serious (yet) about returning Thailand to democracy, and remains convinced that he and his clique could somehow rescue the country from the supposed excesses of democracy under Yingluck Shinawatra. Prayut’s government seems heedless to the dangers of economic populism and civil authoritarianism. Until Prayut accepts a democratic transition, Thailand’s economy will continue to falter, driving away much-needed tourism and foreign investment, and the junta will fast run out of enemies to blame for their own failings. It’s high time for Prayut and his clique to confess they know nothing about government or economics and to assent to the long-awaited and much-delayed democratic transition. Can Thailand's Junta Reverse its Economic Decline?Why Thailand’s Next Election May Not MatterNew Ambassador Holds Key to US-Thailand RelationsThailand Cuts 2015 Economic Growth ForecastWhen Will Thailand’s Elusive Election Be Held?